Twenty-four schools are interested in Notre Dame quarterback Everett Golson, who is eligible to transfer and play immediately. Golson, who redshirted in 2011, is on track to graduate this year and could take advantage of the NCAA's graduate transfer rule and play next season for a different school. Twenty-four schools are interested in Notre Dame quarterback Everett Golson, who is eligible to transfer and play immediately, ESPN's Brett McMurphy reports. Golson, who redshirted in 2011, is on track to graduate this year and could take advantage of the NCAA's graduate transfer rule and play next season for a different school. McMurphy reports six of the teams that are interested in Golson are from the SEC. Last week, the New Orleans Times-Picayune reported Golson had contacted LSU about playing there next season. Golson's quarterback coach, George Whitfield Jr., refuted the rumors, and Golson appeared to do the same on Twitter. Golson completed 60 percent of his passes for 3,445 yards, 29 touchdowns and 14 interceptions while also rushing for eight touchdowns this season for the Fighting Irish. He was benched in the regular season finale against USC and came off the bench during the Music City Bowl win against LSU. In 2012, Golson led Notre Dame to the BCS national title game, where they lost to Alabama. 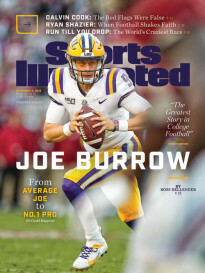 He threw for 2,405 yards, 12 touchdowns and six interceptions and also rushed for six touchdowns in his first year as the team's starting quarterback. He was suspended for the 2013 season after violating the school's honor code. Notre Dame opened the season 6-0 before losing four of its next five games en route to a 8-5 campaign.